Pneumatic tires and solid steel axles rolls easily on smooth or rough terrain. Use it to transport your garden hose wherever you need it, and then reel it in for neat, convenient storage. A built-in basket holds your accessories, and a 6ft. Hose Capacity: 300ft x 5/8". Four strong wheels make it easy to move, a low center of gravity prevent it from tipping, and it will hold up to 300 feet of hose. A great addition to your gardening tools. Tired of fighting with your hose and nozzle that always seem to disappoint?. Looking for a retractable garden hose that alleviates the clutter?. Well, guess what. This here retractable hose reel kit is the solution you've been searching for. This gardening essential combines functionality and quality design. 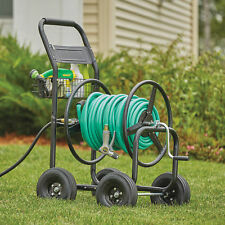 Our heavy-duty hose reel can hold up to 300 feet of 5/8” water hose. The product features a foam-padded handle and solid steel axles to help you get the job done easier and faster. Tired of fighting with your hose and nozzle that always seem to disappoint?. Looking for a retractable garden hose that alleviates the clutter?. Well, guess what. This cubic shape garden hose reel is the solution you've been searching for. Yard Butler, 2 Wheel, Heavy Duty Hose Truck, Durable All Steel Construction With An Anti-Rust Finish & Pneumatic Wheels, Perfect For Rugged Conditions, Wheels & Hand Crank Need To Bolted On & Upper Handle Needs To Be Snapped In Place, Holds Up To 200' Of Hose (Not Included). With 360-degree rotation, this wall-mounting fixture makes use and storage of your hose convenient. It holds up to 125 feet of 5/8-in. Holds up to 125-ft. of 5/8-in. Rust-resistant bronze powder coat finish. GREAT GARDEN HELPER: Space-saving retractable hose and reel keeps your garden hose functional yet out of the way.|DURABLE 65 FOOT HOSE: It comes with a fully retractable 65 ft. hose which supports up to 350 PSI maximum pressure.|RETRACTABLE SYSTEM WITH STOPPER: Features a retracting system for recoiling the hose automatically and a locking device that can hold the hose at a specific length.|SAFE CONSUMER DESIGN: A retraction device ensures that the hose returns back to the reel at a safe speed to prevent injury. Also includes an automatic guide to prevent the hose from overlapping while retracting.|SWIVEL MOUNTING BRACKET: Comes with a swivel mounting bracket which can be mounted on the wall or ceiling and rotates 180 degrees to increase water coverage. Liberty Garden is committed to keeping your garden beautiful. Heavy-duty 13-gauge steel material. Water- and rust-resistant polystyrene finish. 5-foot inlet hose is included. Features all galvanized brass hardware. Hose Capacity: 230ft of 5/8” garden hose / 394ft of 1/2” garden hose. Winding Reel Type: Manual crank. Garden hoses seem compelled to get tangled and unusable. You need a safe and effective solution for your garden hose. 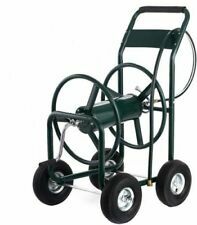 4.5 out of 5 stars - Palm Springs Garden Heavy Duty Water Hose Reel Cart - Hold up to 230FT x 5/8"
14 product ratings14 product ratings - Palm Springs Garden Heavy Duty Water Hose Reel Cart - Hold up to 230FT x 5/8"
Suncast hose reel. Does your hose reel leak?. This is what you need to fix it. You will need 2 o rings. One o ring is just a little bigger than the other. These will fix models: STA100, SWA100, STA100J, STA125B and MJT60DT. Lawn / Garden / Farm Supplies. Power Tools. 5/8" X 90'. Protective collar resists kinks at faucet. Building Materials And Products. Heavy-duty brass couplings with O-ring for tight seals. Rugged cover resists abrasions and will not mar surfaces. Liberty Garden Products Decorative Cast Aluminum Wall Mount Garden Hose Reel. Features: Color: Green Material: ABS (Acrylonitrile Butadiene Styrene) Metal Inlet/ outlet diameter: Approx. 19mm/ 3/4'' -Rust and corrosion resistance. -Easy to assembly. -Lightweight design, convenient to carry. -Simply click hose connector onto the storage terminal after use. -Space-saving storage. -Suitable for home, garden, roads, greenhouse. 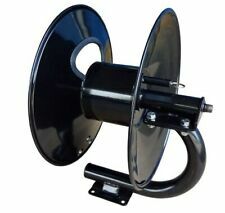 Large capacity wall mount hose reel holds 50 to 225-ft of 5/8-in garden hose. 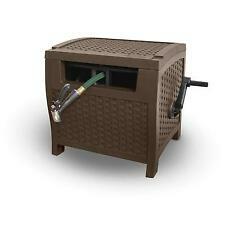 Protect your garden hose from the wind and weather with the Suncast Resin Wicker 175' Hose Reel. Crafted from durable resin this hideaway will not fade, crack, warp, or split and can be left outside year-round. 1 - SUNCAST HOSE REEL IN TUBE / OUT TUBE ASSEMBLY WITH O-RINGS & GREASE. This is the number one part to get lost or broken on a Suncast hose Reel. I attached a breakdown picture of a typical Suncast hose reel above. 1 - SUNCAST HOSE REEL IN TUBE ASSEMBLY WITH O-RINGS. This is the number one part to get lost or broken on a Suncast hose Reel. I attached a breakdown picture of a typical Suncast hose reel above. You can get a lot more use out of your hose reel as they are built fairly good. BCP SKU: SKY635. Combining functionality and quality design, this heavy-duty hose reel can hold up to 300 feet of 5/8 in. Large 10.5 in. Holds up to 300 feet of 5/8" hose. Capacity: 300 ft. of water hose (not included). Convenient storage tray. Resists hose cross threading, stands up to cold temperatures and is 8x stronger than typical plastic water systems. Includes leader hose to attach to faucet. Hose hanger. Holds up to 150' of 5/8" hose. CHANGING OR CANCELING YOUR ORDER. GENUINE SUNCAST PART, Fits Suncast Hideaway and several other hose reels. 1 - SUNCAST HOSE REEL. The Suncast Hose reels have a couple different productions. Does not include Out Tube. IN TUBE & GREASE & INSTRUCTIONS. 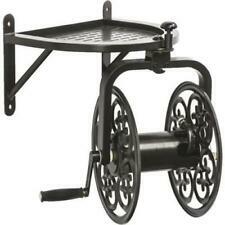 Large capacity wall mount hose reel holds 50 to 225-ft of 5/8-in garden hose. Plastic 225-ft Wall-Mount Hose Reel. Type of Hose Reel Wall-mount. Reel Material Plastic. Hose Length (Feet) 225. Includes leader hose to attach to faucet. Count on a Flexogen garden hose to curve without kinking, connect without leaking and hold up season upon season. Garden Hose. Flow Guard Plus� protective collar resists kinks at faucet. Polished surface resists abrasions, stains, and mildew. The Suncast hose hanger mounts to a wall, so your watering accessories are not cluttering the ground. It is made from poly material. Holds up to 150 feet of 5/8 hose. Features a storage shelf for watering accessories and sturdy resin construction. This happy frog is happy to help you keep your garden hose from cluttering up your yard. Holds up to 50 ft. of garden hose. Keep your garden hose tangle-free and organized with this charming frog! 10015517 Frolicking Frog Hose Organizer. Product Parameter: 1. Material: ABS plastic aluminium alloy 2. Weight: About 1.5kg 3. Product size: About 30 * 29.5 * 31 cm 4. Color: Blue black 5. Maximum winding range: 1/2'' * 30 m, 5/8'' * 20 m. Features: 1. Precision ABS plastic 2. Aluminium alloy bracket 3. Flexibile and portable 4. Labor saving and quick storage by hand shaking. 5. Built-in waterpipe interface，Please check the diameter of waterpipe before buying. GENUINE SUNCAST PART, Fits Suncast PPJ100DT Hideaway hose reels. FITS SUNCAST HIDEAWAY PPJ100DT (and many other models). 1 - SUNCAST HOSE REEL IN TUBE / OUT TUBE ASSEMBLY WITH O-RINGS & GREASE & INSTRUCTIONS. Garden Water Hose Holder Birds In Tree Cast Iron Hanger Reel Yard Decor 12.5"